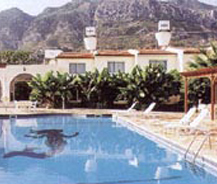 Club Alda is situated at the west of Kyrenia in the holiday town of lapta. It is at a distance of 11 km from Kyrenia and from here Airport is just 55 km so it is easy for the guests to reach within one hour and they can enjoy their holiday at the most. This Alda club is situated between the green Besparmak Mountains and the sparkling blue Mediterranean Sea hence the surrounding will be more elegant and very attractive. Many guests are regular to this club mainly because of its location. In the club area there are lemon and banana grooves which also make the look better and very attractive because of its greenness between sea and mountains. This club is open all the time during the year and you can visit this anytime in your holidays and it will be unforgettable for everyone. Other than these the hotel has many rooms with all facilities such as television, mini bar heating, air conditioner, water heater and etc., this club is suitable for people who like to enjoy their holiday at less expense with all the necessary facilities. Also it is very friendly to people and it is a trustworthy one among the many clubs around this region.